The road connects the town. There is moving and encounters the same time: A place for communication of the inhabitants. But what happens when the road is deprived of its proper function, it mutates into a tunnel of speed? Man transform into an outsider. A barrier is built up and it links no longer but splits. 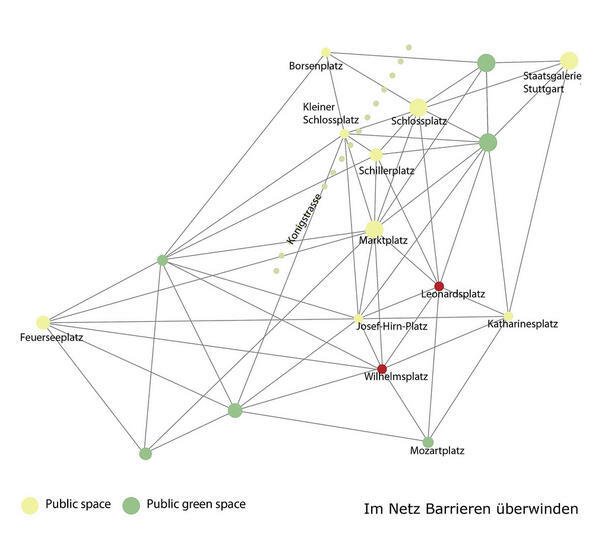 The Stuttgart City ring arouses a sense of this non-human barrier. In the southeast the “Hauptstädterstraße” cuts through the historical city center of Stuttgart. 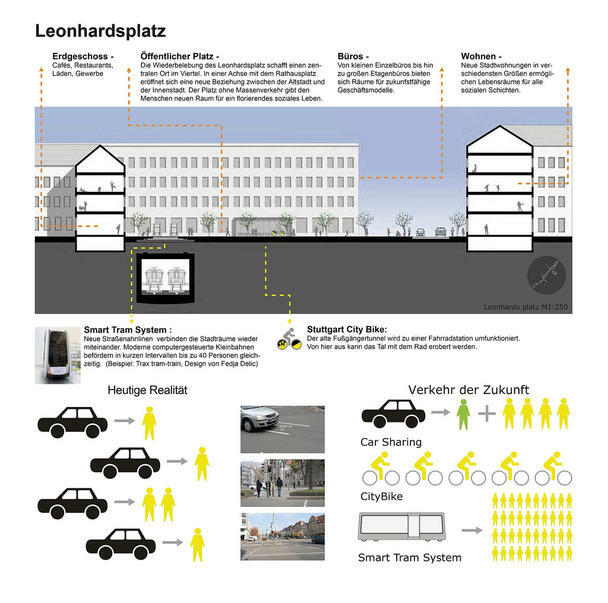 The “Bohnenviertel” and the adjacent “Leonhardsviertel” have difficulties to find connection. As ambience places, they are often the focus of urban development. In order to allow them to participate in the downtown vitality the structural barriers need to be overcome. Gaps will be filled and spaces created. 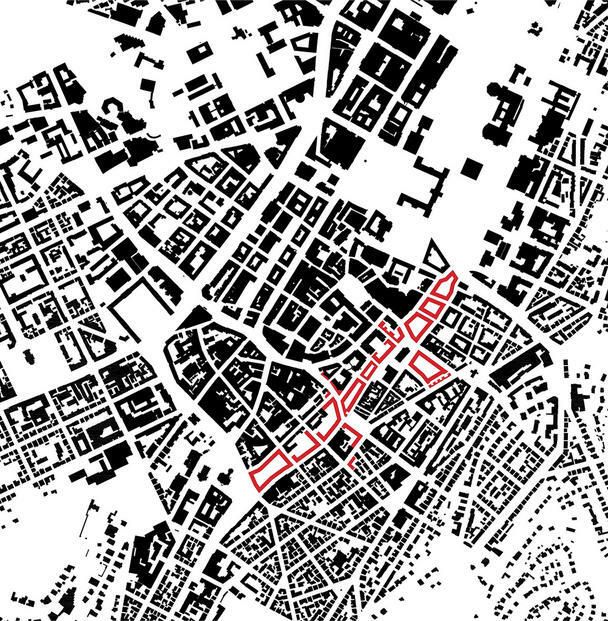 Giving the road back its actual function is the goal of the design, to blend and connect it with the city. A rethink is needed in the future. Instead of a large swathe an intelligent grid offers new ways. It wraps around the new and recaptured habitats. More people will benefit from the short distances. To enforce this approach a utopia is necessary. Ensuring the human perspective is the focus. With changes in traffic patterns, the car loses the carriage of a particular importance. The surrounding neighbourhoods are characterized by great diversity. From large office spaces to individual houses with different designs the spectrum consists of all possible habitats. The new buildings rely on the variations. Even if they are indeed clear blocks, they adapt to the unique challenges and provide guidance for further changes. 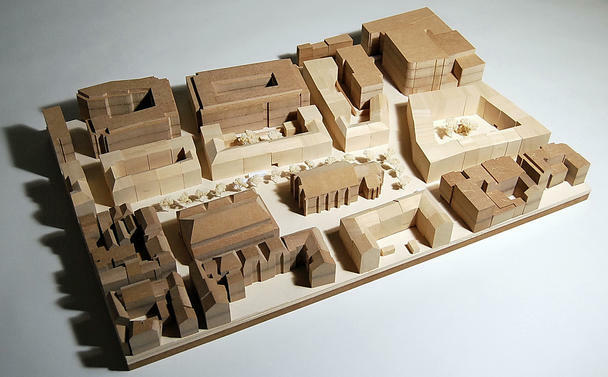 Townhouses and residential buildings can offer living spaces in various sizes to appeal to many people. For the purposes of short distances in the ground floors there are usually commercial sites available. 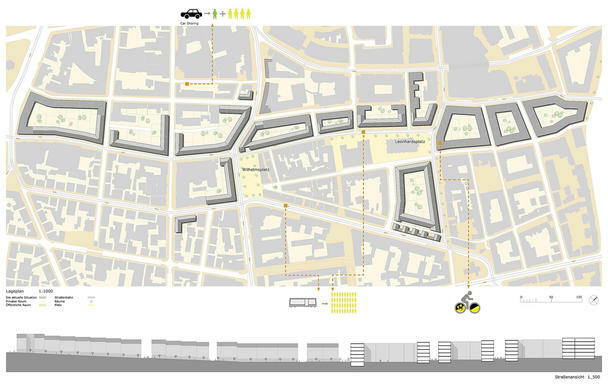 The aim is not only to install future urban transport concepts, but also implement sociological aspects of city planning. 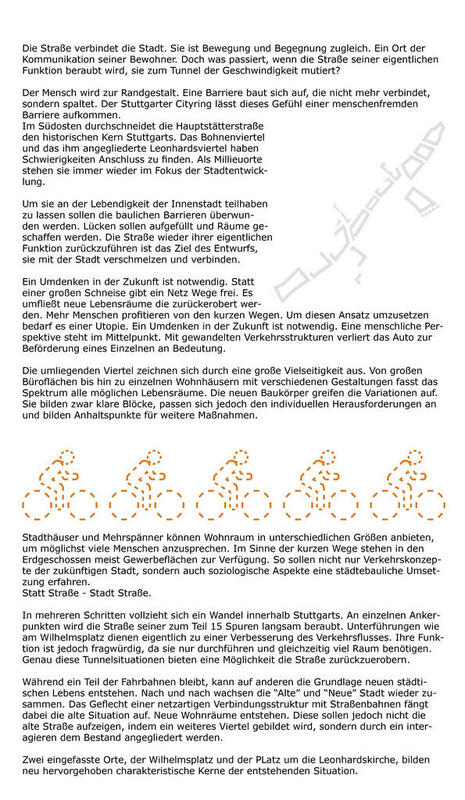 In several steps, a change takes place in Stuttgart. At each anchor point, the road is slowly deprived of its sometimes 15 tracks. Underpasses as to be found at the “Wilhelmplatz” were served to improve traffic flow. Their function is questionable and they require a lot of space. It is these tunnel situations that provide an opportunity to regain the road. While some lanes of the road remain, others may arise new urban life. Step by step the „Old“ and „new“ city are linked again. The net-like structure connecting with trams catches attention to the old situation. New residential spaces are created. This will not show the old road by forming a further quarter. 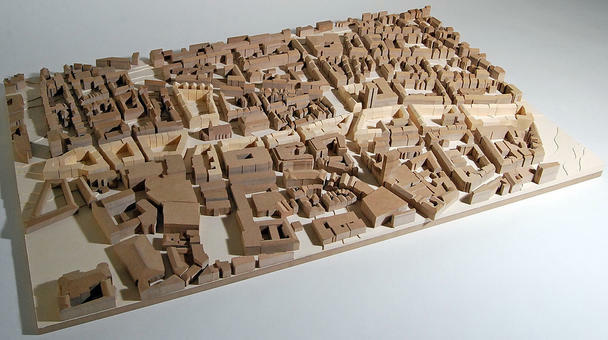 It will be attach to the existing Buildings by interacting the components. 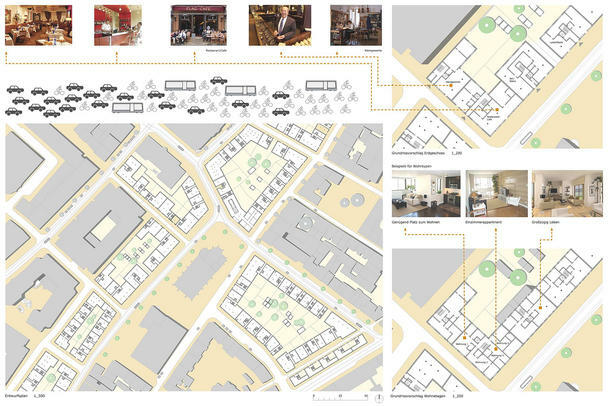 Two framed sites, the “Wilhelmsplatz” and the space around the “Leonhardskirche” form, highlighted new characteristic centres of the emerging situation.